apparently all was in hand. i awoke to a chorus of "happy birthday" and a cup of tea in bed... a luxury that has not been mine for a long time and one that was so very welcome. the day past pleasantly and relaxingly... one cannot ask for more than that. How did you come up with the idea for the challenge? it just popped into my head a few weeks back when i was thinking about how i enjoy thrifting and i love handcrafted. i began to wonder if i could carry that through 100% into my everyday life... i do not particularly enjoy high street shopping although saying that, i have a soft spot for Anthropologie and NOA NOA which is going to make this challenge a little heart wrenching. but mainly i get my 'shopping fix' from secondhand buys and items that have been handcrafted. i'm actually rather excited to see in a year's time just how much the way i shop has changed and evolved... i always have in my ear "is it a need or a want?" when i am out in the shops and if i'm totally honest with myself, 9 times out of 10 it is probably a "want" and that is very telling in it's self. So in the home, are we basically talking about everything, besides food/groceries here? joking aside, i do have a large family and a washing machine is a necessary item, if my machine did break and i needed to replace it, i'm not going to make life miserable for myself. if i have to buy one, i have to buy one... this is really a challenge to see how little one can do without buying new. Is there anything in the home or closet not included in the challenge? undies, tights and gifts given to me... of course now i'm fretting about other things like yarn. You’ve mentioned that you have already thought about some of the problems that may come up along the way, what have you thought of? the only thing that i have 'Nagging Mr Doubt' going off in my ear about is appliances and electronics, pretty much anything else i don't seem to think will be a problem. when i tire of my clothing then i shall get creative with the help of Miss Ethel, my trusty sewing machine or i shall peruse the aisles of the thrift store. and of course there is always the wonderful world of Etsy for handcrafted goodness when it comes to just about anything. Will you involve your children in this challenge? this challenge is for myself, i have not included my children in this. although my eldest daughter does a fabulous job at finding clothes from the thrift store. that being said if they need a piece of furniture for their bedrooms, it will be found secondhand... pretty much most things will, with the exception of some clothing. i think i'll dip my feet in, try it myself and if after a year, realize it's the only way to go, then perhaps i will encourage them to join me on my journey through a thrifted, handcrafted lifestyle. How can others get involved in the challenge? if anyone reading this fancies joining in, it's quite simply a matter of choosing to only buy handcrafted or secondhand for your home and your closet for one year. all you have to do is pick a day that works for you to start and then go for it. anyone wishing to join in is most welcome to add my 'challenge of the utmost kind' button to their blog and link it to me so others can find out information if they wish. be sure to let me know, so in return i can add you to my 'challengers' link list... i hope that all makes sense!! i also want to make it quite clear, this is suppose to be fun, a way to get creative within the home and to perhaps focus on something positive. it doesn't matter if you stumble along the way... it's more about learning from the experience and growing with it. and perhaps looking back after a year and being rather proud of supporting handcrafters and the efforts made of 're-using' items that still have plenty of life left in them. 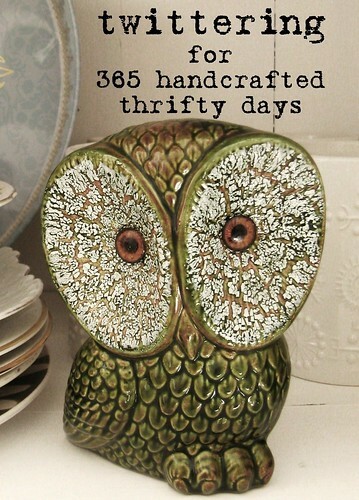 i can't believe i have, i never thought i would see the day... i have no knowledge of this 'twittering lark' and yet i find myself 'twittering' (or 'tweeting' as my children corrected me... see i've already got that bit wrong) to cover the next 365 thrifty, crafty days. so with the encouragement of my man, my children and kelsey (our #2's friend, who is very 'twitter' aware from where i am standing), i have further dipped my toes into yet another 'unknown', but i have high hopes of 'bluffing' my way through as usual. I think your challenge is a fantastic one - I, too, have been trying to operate like this for some time, but think it will make a difference to be really explicit. Up until now I have also added ethical - so for eg underwear you could buy from an ethical supplier (like Gossypium or People Tree). And for food I avoid supermarkets - different things are possible for different people, but I think it is really valuable to think it all through, and really work out how to tread lightly. For yarn you could choose small scale suppliers or producers, maybe using local (ish) fibres? I have lots to think about - especially as we need to improve our kitchen, and can't really afford the local, handmade designers. But I will definitely take this pledge - watch my space! Thank you for taking such a public stand, and encouraging us all! So glad you had a swell day. You could ask for yarn from Santa this christmas time, and tights. I always ask for tights and stripey socks. Brave girl you, leaping onto the twitter train! I haven't the foggiest when it comes to that. Our computer is on its last legs (well, on a few of them - some of them have already crumpled) and we are pricing up the green alternative provided by our village computer bods and the mainstream 'complete replacement' option. And so on it goes... I am going to reflect carefully on the challenge - thanks for setting it, and for going for it yourself! If I go for it, I'll be sure to get back to you. You're on my reading list now, so I'll see how you're getting on. From Floss in France, only 9 months younger than you! Hi Tif, you don't know me, I think I found your blog through the Granny Chic group on Flickr.I have just turned the big 5-0 so I am a little further down the track than you. The thing is, this challenge of yours is starting to haunt me and I think I will have to join in. I will keep thinking about it for today and get back to you with my decision - I think it will be great fun and force all sorts of creativity and inventiveness. You are one inspiring lady and I very keen. Hi Tif! I think you're going to end up inspiring me to join in on the Challenge as well! I just need to ponder the exceptions part, but as soon as I figure it out, my blog will be proudly wearing your button. ps Etsy's a great source for handmade fibers!!! Perhaps working out a trade with someone who's got a ridiculously large yarn stash would work too. Tif, you always inspire and challenge me to rise to your example! If I could come up with just half the energy, creativity and passion for living that you demonstrate on a daily basis I'd be thrilled. So count me in, please! I'm off to post the challenge and button on my blog - YAY! Thank you for your lovely supportive comment over on my Yellow blog. Isn't it exciting to see so many people seriously considering taking part in the challenge? You have inspired us all! Thank you so much - you are a star! Hey Tif, Happy Birthday, I think like everyone else who has commented that I will either join or attampt to give it ago...Im loving the sound of it, but the reality of it may be quite another thing. lol. Cheers for putting it out there. Happy Birthday! I've started the challenge too and want to blog about the reasons why I took it on too. A good start to a new season! I have also seen some amazing etsy undies . I love the idea of this challenge. I pretty much live this way already. My house is like a second-hand wonderland. LOL - now THAT's a great blog name! Maybe I should change my blog's name, ha...I digress. Best of luck to you on your challenge, and I hope you have a lovely 41st year. I'll be following along! Tif, yarn is so easy to find in thrift shops and yard sales. (I found to huge SPOOLS of red and white wool yarn for $2 each at a yard sale) You should be fine with that if you can hunt for it and have a little luck. hi dottie, i'm inspired by your challenge and have begun, but with many more exceptions than may be virtuous. i'm also newly-turned 41 and feeling good about taking this on! I came here by way of Sarah's blog (Red Gingham). I would love to be part of this challenge, seeing how thrift-shopping and buying secondhand is quite the only shopping I like best. Things here in Zürich are exorbitant! Just about everything I possess are secondhand, or handmade (by myself), except for English books though. That might be a little problem, but I'll see what I can manage. Thanks for the inspiration! Very Best of Luck with your Challenge - If only more people in todays disposable society would make an effort like this! 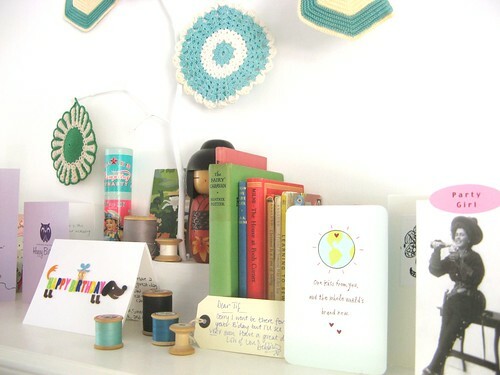 Another treasure trove for Handmade Bits is Folksy.com!